It’s possible to believe a lot of whacky stories about Trevor Bauer, who is both a big old dummy and also a too-online crank who once wanted to use a soldering iron to cauterize a finger wound. A report that Bauer wants to use alternative methods to treat the stress fracture in his right fibula would surprise exactly no one. A report that he’s attributing the injury to “CIA nanites” should at least raise a few red flags? 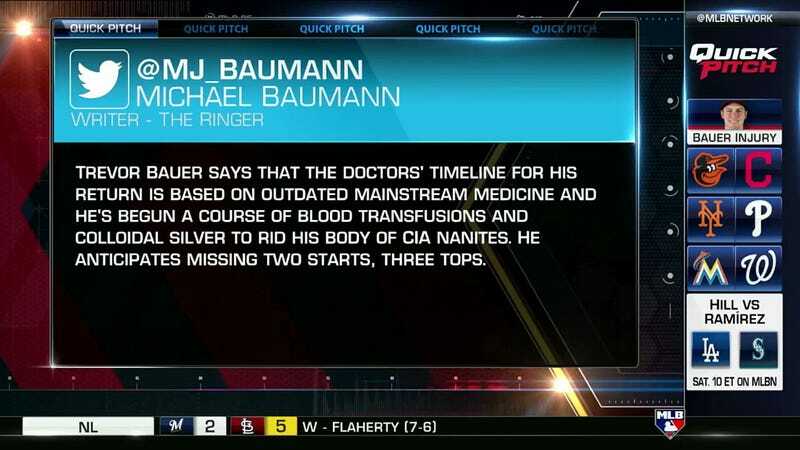 It’s a very funny idea, and honestly we are probably only a few news cycles and/or Twitter shadow bannings away from Bauer having himself scanned for CIA nanotechnology, but maybe someone should’ve checked with him before reporting this on television! If ESPN presented this, as Bauer suggests, with anything like the credulousness of MLB Network, probably it is because of a government conspiracy having to do with chemtrails and pizza parlors.